Ashton-under-Lyne Market – Another Award! Congratulations to the Market Staff in Ashton-under-Lyne! Another fantastic plus for our town! Tameside markets are top of the shops after winning a hatrick of national awards! Borough is home to Britain’s favourite and greenest market as well as the most dedicated team of staff, according to industry bosses. Tameside’s marvellous markets are celebrating a hatrick of three top industry awards. Staff have been named ‘market team of the year’ by the National Association of British Market Authorities (NABMA) after impressing judges with their enthusiasm and the range and quality of services. Following a public vote earlier this year NABMA crowned Ashton as Britain’s favourite market. It was also named the country’s greenest market by the National Market Traders’ Federation. 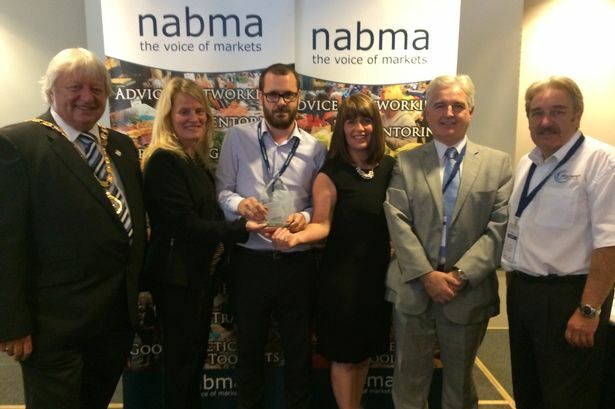 NABMA chief executive Graham Wilson said: “We’re delighted to make this award to Tameside as market team of the year. This entry was posted in Ashton-under-Lyne Blog on October 3, 2014 by rogerfarnworth.